11 D None No Power Seat 11 D is a Business Class bulkhead seat, although the proximity to the galley may be bothersome. Passengers traveling with infants are often seated in this row. There is no floor storage for this seat during take-off and landing. 11 F None No Power Seat 11 F is a Business Class bulkhead seat, although the proximity to the galley may be bothersome. Passengers traveling with infants are often seated in this row. There is no floor storage for this seat during take-off and landing. 12 A None No Power Seat 12 A is a Business Class bulkhead seat with extra legroom due to the position of the bulkhead. Passengers with infants are often seated in this row. There is no floor storage for this seat during take-off and landing. 12 C None No Power Seat 12 C is a Business Class bulkhead seat with extra legroom due to the position of the bulkhead. Passengers with infants are often seated in this row. There is no floor storage for this seat during take-off and landing. 12 H None No Power Seat 12 H is a Business Class bulkhead seat with extra legroom due to the position of the bulkhead. Passengers with infants are often seated in this row. There is no floor storage for this seat during take-off and landing. 12 K None No Power Seat 12 K is a Business Class bulkhead seat with extra legroom due to the position of the bulkhead. Passengers with infants are often seated in this row. There is no floor storage for this seat during take-off and landing. 16 A None No Power Seat 16 A is a Business Class seat, although proximity to the galley may be bothersome. This row has a misaligned window. 16 C None No Power Seat 16 C is a standard Business Class seat, although proximity to the galley may be bothersome. This row has a misaligned window. 16 H None No Power Seat 16 H is a Business Class seat, although proximity to the galley and lavatory may be bothersome. This row has a misaligned window. 16 K None No Power Seat 16 K is a Business Class seat, although proximity to the galley and lavatory may be bothersome. This row has a misaligned window. 17 A None No Power Seat 17 A is a Business Class bulkhead seat, although the proximity to the lavatory may be bothersome. Passengers traveling with infants are often seated in this row. There is no floor storage for this seat during take-off and landing. 17 C None No Power Seat 17 C is a Business Class bulkhead seat, although the proximity to the lavatory may be bothersome. Passengers traveling with infants are often seated in this row. There is no floor storage for this seat during take-off and landing. 17 D None No Power Seat 17 D is a Business Class seat, although the proximity to the lavatory may be bothersome. There is no floor storage for this seat during take-off and landing. 17 F None No Power Seat 17 F is a Business Class seat, although the proximity to the lavatory may be bothersome. There is no floor storage for this seat during take-off and landing. 17 H None No Power Seat 17 H is a Business Class bulkhead seat, although the proximity to the lavatory may be bothersome. Passengers traveling with infants are often seated in this row. There is no floor storage for this seat during take-off and landing. 17 K None No Power Seat 17 K is a Business Class bulkhead seat, although the proximity to the lavatory may be bothersome. Passengers traveling with infants are often seated in this row. There is no floor storage for this seat during take-off and landing. 31 A None No Power Seat 31 A is a standard Economy seat that Singapore Air designates as a "Forward Zone Seat". Forward Zone Seats enable you to be among the first in Economy Class to disembark the plane. You may select these seats in advance for free when you book a Flexi fare type. When you book a Lite or Standard fare type, there is an additional fee for this seat. Passengers traveling with infants are often seated in this row. This seat has the tray table located in the armrest making the armrest immovable and slightly reducing seat width. There is no floor storage for this seat during take-off and landing. 31 B None No Power Seat 31 B is a standard Economy seat that Singapore Air designates as a "Forward Zone Seat". Forward Zone Seats enable you to be among the first in Economy Class to disembark the plane. You may select these seats in advance for free when you book a Flexi fare type. When you book a Lite or Standard fare type, there is an additional fee for this seat. Passengers traveling with infants are often seated in this row. This seat has the tray table located in the armrest making the armrest immovable and slightly reducing seat width. There is no floor storage for this seat during take-off and landing. 31 C None No Power Seat 31 C is a standard Economy seat that Singapore Air designates as a "Forward Zone Seat". Forward Zone Seats enable you to be among the first in Economy Class to disembark the plane. You may select these seats in advance for free when you book a Flexi fare type. When you book a Lite or Standard fare type, there is an additional fee for this seat. Passengers traveling with infants are often seated in this row. This seat has the tray table located in the armrest making the armrest immovable and slightly reducing seat width. There is no floor storage for this seat during take-off and landing. 31 D None No Power Seat 31 D is a standard Economy seat that Singapore Air designates as a "Forward Zone Seat". Forward Zone Seats enable you to be among the first in Economy Class to disembark the plane. You may select these seats in advance for free when you book a Flexi fare type. When you book a Lite or Standard fare type, there is an additional fee for this seat. Passengers traveling with infants are often seated in this row. This seat has the tray table located in the armrest making the armrest immovable and slightly reducing seat width. There is no floor storage for this seat during take-off and landing. 31 E None No Power Seat 31 E is a standard Economy seat that Singapore Air designates as a "Forward Zone Seat". Forward Zone Seats enable you to be among the first in Economy Class to disembark the plane. You may select these seats in advance for free when you book a Flexi fare type. When you book a Lite or Standard fare type, there is an additional fee for this seat. Passengers traveling with infants are often seated in this row. This seat has the tray table located in the armrest making the armrest immovable and slightly reducing seat width. There is no floor storage for this seat during take-off and landing. 31 G None No Power Seat 31 G is a standard Economy seat that Singapore Air designates as a "Forward Zone Seat". Forward Zone Seats enable you to be among the first in Economy Class to disembark the plane. You may select these seats in advance for free when you book a Flexi fare type. When you book a Lite or Standard fare type, there is an additional fee for this seat. Passengers traveling with infants are often seated in this row. This seat has the tray table located in the armrest making the armrest immovable and slightly reducing seat width. There is no floor storage for this seat during take-off and landing. 31 H None No Power Seat 31 H is a standard Economy seat that Singapore Air designates as a "Forward Zone Seat". Forward Zone Seats enable you to be among the first in Economy Class to disembark the plane. You may select these seats in advance for free when you book a Flexi fare type. When you book a Lite or Standard fare type, there is an additional fee for this seat. Passengers traveling with infants are often seated in this row. This seat has the tray table located in the armrest making the armrest immovable and slightly reducing seat width. There is no floor storage for this seat during take-off and landing. 31 J None No Power Seat 31 J is a standard Economy seat that Singapore Air designates as a "Forward Zone Seat". Forward Zone Seats enable you to be among the first in Economy Class to disembark the plane. You may select these seats in advance for free when you book a Flexi fare type. When you book a Lite or Standard fare type, there is an additional fee for this seat. Passengers traveling with infants are often seated in this row. This seat has the tray table located in the armrest making the armrest immovable and slightly reducing seat width. There is no floor storage for this seat during take-off and landing. 31 K None No Power Seat 31 K is a standard Economy seat that Singapore Air designates as a "Forward Zone Seat". Forward Zone Seats enable you to be among the first in Economy Class to disembark the plane. You may select these seats in advance for free when you book a Flexi fare type. When you book a Lite or Standard fare type, there is an additional fee for this seat. Passengers traveling with infants are often seated in this row. This seat has the tray table located in the armrest making the armrest immovable and slightly reducing seat width. There is no floor storage for this seat during take-off and landing. 36 A None No Power Seat 36 A is a standard Economy seat that Singapore Air designates as a "Forward Zone Seat". Forward Zone Seats enable you to be among the first in Economy Class to disembark the plane. You may select these seats in advance for free when you book a Flexi fare type. When you book a Lite or Standard fare type, there is an additional fee for this seat. This seat is missing a window. 36 K None No Power Seat 36 K is a standard Economy seat that Singapore Air designates as a "Forward Zone Seat". Forward Zone Seats enable you to be among the first in Economy Class to disembark the plane. You may select these seats in advance for free when you book a Flexi fare type. When you book a Lite or Standard fare type, there is an additional fee for this seat. This seat is missing a window. 41 H None No Power Seat 41 H has limited storage space and legroom due to the presence of an entertainment box underneath the seat in front. 42 A None No Power Seat 42 A may have limited recline and proximity to the lavatories may be bothersome. 42 B None No Power Seat 42 B may have limited recline and proximity to the lavatories may be bothersome. 42 C None No Power Seat 42 C may have limited recline and proximity to the lavatories may be bothersome. 42 H None No Power Seat 42 H may have limited recline and proximity to the lavatories may be bothersome. 42 J None No Power Seat 42 J may have limited recline and proximity to the lavatories may be bothersome. 42 K None No Power Seat 42 K may have limited recline and proximity to the lavatories may be bothersome. 43 D None No Power Seat 43 D may have limited recline and proximity to the lavatories may be bothersome. 43 E None No Power Seat 43 E may have limited recline and proximity to the lavatories may be bothersome. 43 G None No Power Seat 43 G may have limited recline and proximity to the lavatories may be bothersome. 44 A None No Power Seat 44 A is an Economy seat that may have some extra legroom due to the exit row. However, the proximity to the lavatories may be bothersome. This seat has the tray table located in the armrest making the armrest immovable and slightly reducing seat width. There is no floor storage for this seat during take-off and landing. 44 C None No Power Seat 44 C is an Economy seat that may have some extra legroom due to the exit row. However, the proximity to the lavatories may be bothersome. This seat has the tray table located in the armrest making the armrest immovable and slightly reducing seat width. There is no floor storage for this seat during take-off and landing. 44 H None No Power Seat 44 H is an Economy seat that may have some extra legroom due to the exit row. However, the proximity to the lavatories may be bothersome. This seat has the tray table located in the armrest making the armrest immovable and slightly reducing seat width. There is no floor storage for this seat during take-off and landing. 44 K None No Power Seat 44 K is an Economy seat that may have some extra legroom due to the exit row. However, the proximity to the lavatories may be bothersome. This seat has the tray table located in the armrest making the armrest immovable and slightly reducing seat width. There is no floor storage for this seat during take-off and landing. 45 C None No Power Seat 45 C is an Economy Class seat that has extra legroom due to the absence of the seat ahead. The tray table and personal TV are located in the armrest, making the armrest immovable and slightly reducing seat width. There is no floor storage for this seat during take-off and landing. 45 D None No Power Seat 45 D is an Economy Class bulkhead seat, although the proximity to the lavatory may be bothersome. Passengers traveling with infants are often seated in this row. This seat has the tray table located in the armrest making the armrest immovable and slightly reducing seat width. There is no floor storage for this seat during take-off and landing. 45 E None No Power Seat 45 E is an Economy Class bulkhead seat, although the proximity to the lavatory may be bothersome. Passengers traveling with infants are often seated in this row. This seat has the tray table located in the armrest making the armrest immovable and slightly reducing seat width. There is no floor storage for this seat during take-off and landing. 45 G None No Power Seat 45 G is an Economy Class bulkhead seat, although the proximity to the lavatory may be bothersome. Passengers traveling with infants are often seated in this row. This seat has the tray table located in the armrest making the armrest immovable and slightly reducing seat width. There is no floor storage for this seat during take-off and landing. 45 H None No Power Seat 45 H is an Economy Class seat that has extra legroom due to the absence of the seat ahead. The tray table and personal TV are located in the armrest, making the armrest immovable and slightly reducing seat width. There is no floor storage for this seat during take-off and landing. 55 C None No Power Seat 55 C juts into the aisle and is often bumped by service carts and others passengers due to the awkward configuration transition from 3 to 2 seats. 55 H None No Power Seat 55 H juts into the aisle and is often bumped by service carts and others passengers due to the awkward configuration transition from 3 to 2 seats. 56 A None No Power Seat 56 A is a standard Economy Class seat. There are only two seats in this row, making this seat ideal if traveling with a partner. 56 C None No Power Seat 56 C is a standard Economy Class seat. There are only two seats in this row, making this seat ideal if traveling with a partner. 56 H None No Power Seat 56 H is a standard Economy Class seat. There are only two seats in this row, making this seat ideal if traveling with a partner. 56 K None No Power Seat 56 K is a standard Economy Class seat. There are only two seats in this row, making this seat ideal if traveling with a partner. 57 A None No Power Seat 57 A is located in the last row of the aircraft and may have limited recline. The proximity to the galley and rear of the plane may be bothersome. There are only two seats in this row, making this seat ideal if traveling with a partner. 57 C None No Power Seat 57 C is located in the last row of the aircraft and may have limited recline. The proximity to the galley and rear of the plane may be bothersome. There are only two seats in this row, making this seat ideal if traveling with a partner. 57 D None No Power Seat 57 D is located in the last row of the aircraft and may have limited recline. The proximity to the galley and rear of the plane may be bothersome. 57 H None No Power Seat 57 H is located in the last row of the aircraft and may have limited recline. The proximity to the galley and rear of the plane may be bothersome. There are only two seats in this row, making this seat ideal if traveling with a partner. 57 K None No Power Seat 57 K is located in the last row of the aircraft and may have limited recline. The proximity to the galley and rear of the plane may be bothersome. There are only two seats in this row, making this seat ideal if traveling with a partner. There are 18 777-200 in the Singapore Airlines fleet. This aircraft is operated in four different versions. This Version 2 operates in a two class configuration. This aircraft has 266 seats. To verify the correct version of this aircraft at the time of booking or at online check-in, the following rows may be used as reference: Business Class are rows 11-16 in the first compartment and 17-19 in the second compartment. I sat in 50J and noted that 50H, the aisle seat, had an entertainment box under the seat in front. 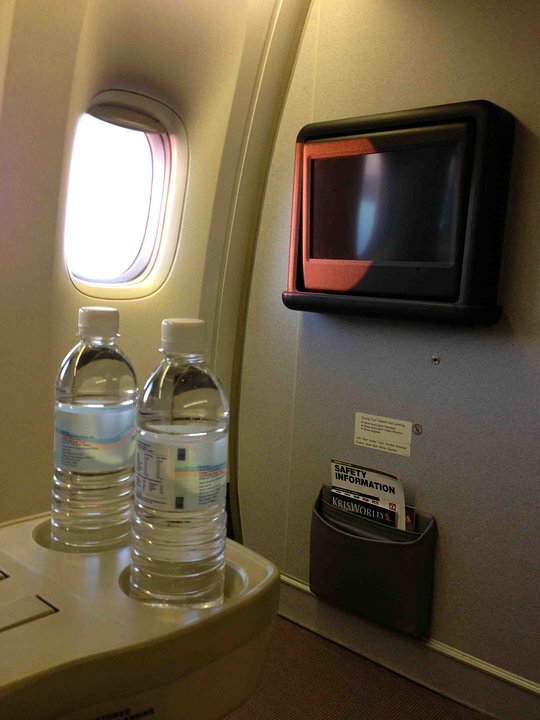 there is an entertainment box under the seat in front, which restricts leg room for 33D. This is a older aircraft with inferior angle flat business class seats. These seats are narrower than business class seats on -300ER and newer space bed seats on -200ER aircraft. In flat position the seat tilts at an angle (so you sleep inclined) and is not nearly as comfortable as other SIA business class products. Customers on SQ291/SQ292 aka "Capital Express" (connects Singapore to Canberra and Wellington) be warned that this aircraft is presently used on this sector. I was originally meant to be on the refurbished 777-200ER, but the flight was changed last minute. Although Business Class is very nice, I'd recommend avoiding the bulkhead seat. You have less privacy, and less storage space. This review is for the 777 SR refit plane. We flew Hong Kong to Singapore, approximately 3 hours 50 minutes. It is an older aircraft but the seating was reasonably comfortable. Seats 39E and G are in an okay spot, close to the toilets but not too close to be annoying. The entertainment unit did not work in 39G so I did not get the safety info. Luckily we didn't have to ditch into the South China Sea because I would have had no clue what to do! The cabin crew were stern and aloof and seemed particularly put out when I declined breakfast. Even after I explained that I did not feel very well, they seemed to take it as a person affront. Strange.